Placing your order is a piece of cake! 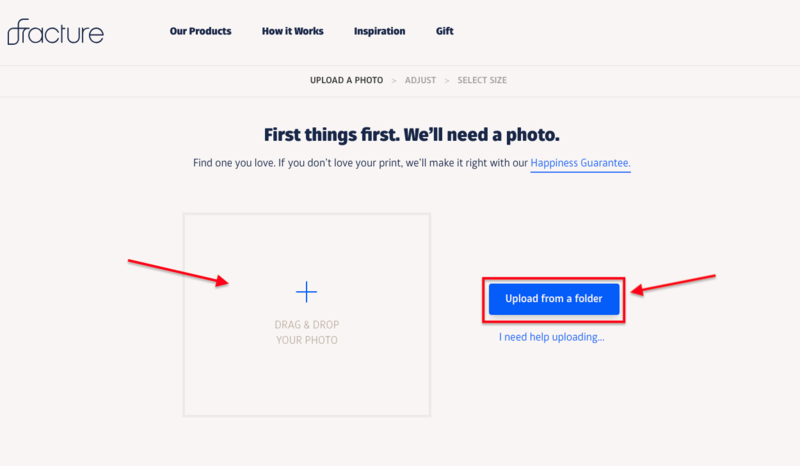 Once you have the images you'd like printed saved onto your computer or mobile device, just follow the steps below and you'll be on your way to having them Fractured. Start off at the fracture.me home page and click on the “Get Started” button at the top right. 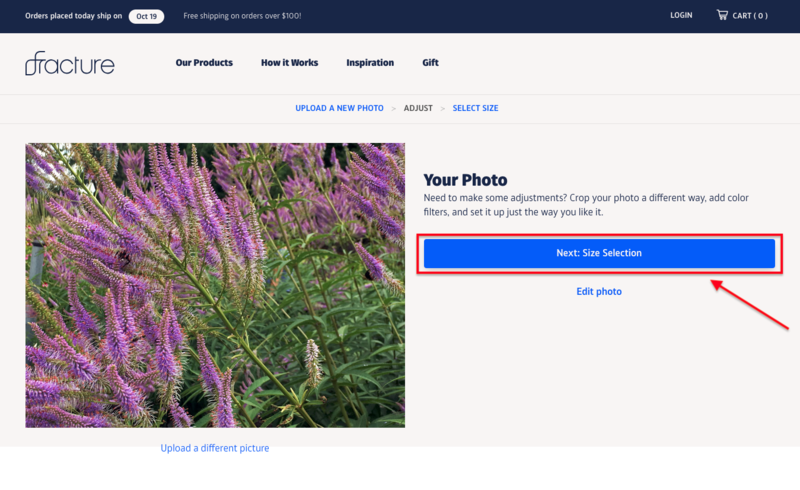 From here, you can drag and drop an image from your computer, or click the " Upload from a folder" button to select your photo from where it's saved on your computer. 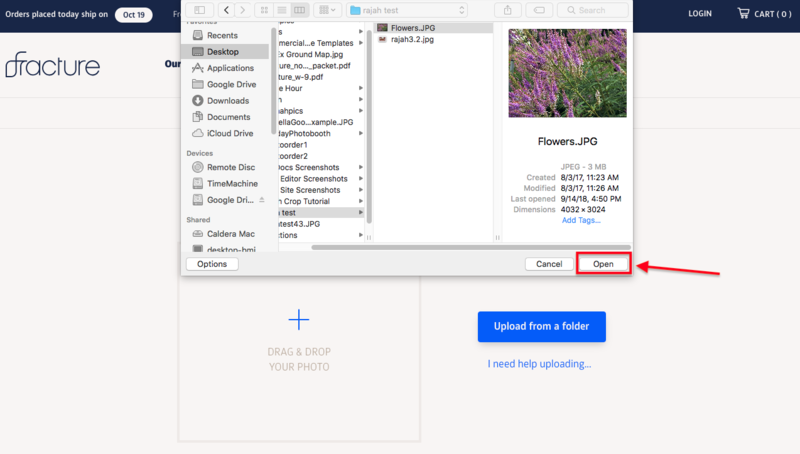 * Mac Users: If you'd like to upload a photo from your iPhoto Library or the Photos app, be sure to copy/export it onto your desktop or another folder first. You won’t be able to directly upload it from iPhoto or the Photos app. 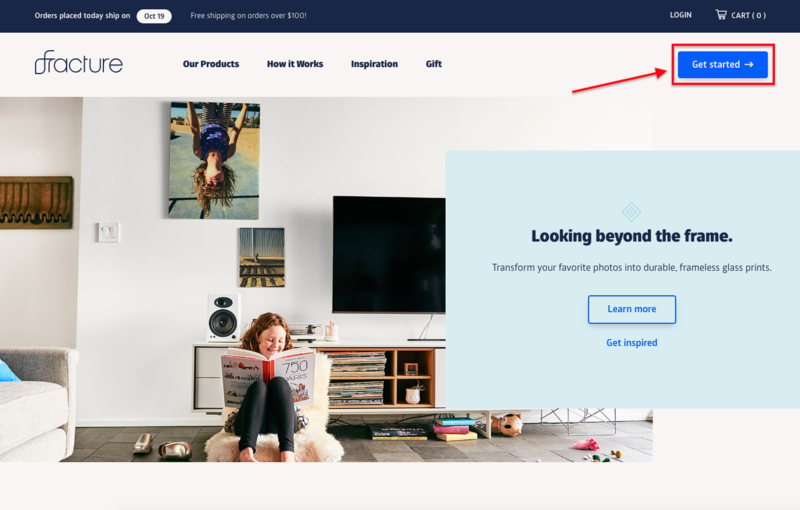 Once your photo is uploaded, you'll see a preview screen with your image. Click Edit photo to make any cropping adjustments or minor edits, if needed. To continue, click Next: Size Selection. Now comes the fun part! Select the print size you'd like to order. The dimensions of your selected size will be displayed in inches beneath each individual preview--that way, you can get an idea of your Fracture’s actual size. If you notice a red asterisk warning(*) next to the size you’re looking to select, double check to make sure the file size large enough. This warning indicates that the print quality will be a little blurry or pixelated at that size. 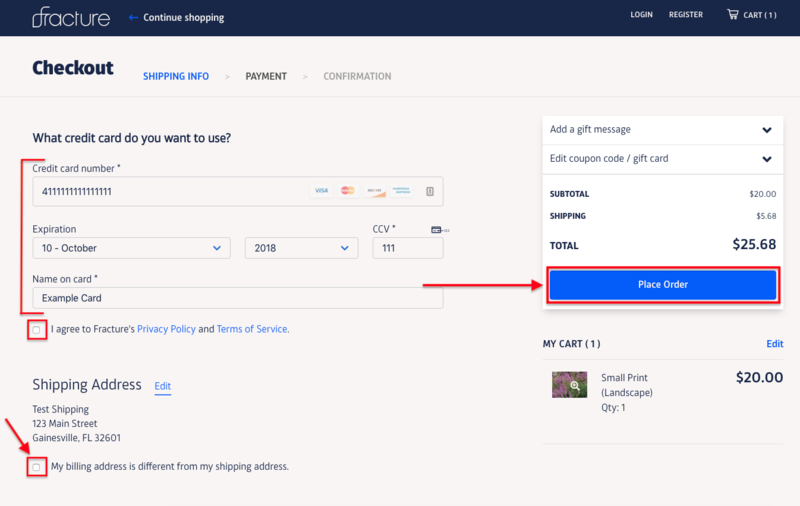 Once you select your size and quantity, click the "Add to Cart” button at the bottom right-hand corner. You're almost there! Now that you're on the cart page, you can review your order and make sure everything is good to go. Don’t worry, your order isn’t set in stone just yet! If you’d like to make any changes (i.e. 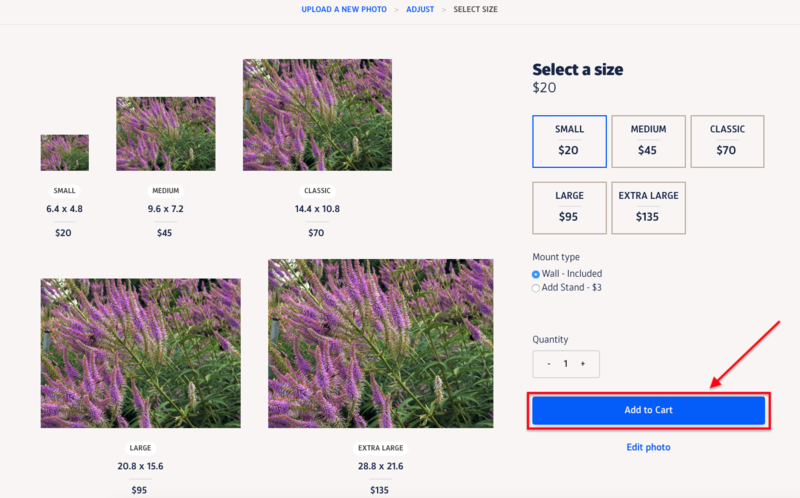 size, quantity, or the photo itself), click the Edit button. If you have a coupon code or gift certificate (lucky you! ), be sure to apply it here before continuing to the next page. You can also choose to add more Fractures to your order. Once everything is in place, click the "Pay with credit card" button. Next, we’ll need to know where to send your Fracture. If your Fracture is being sent to a different address than your own, we’ve got you covered. 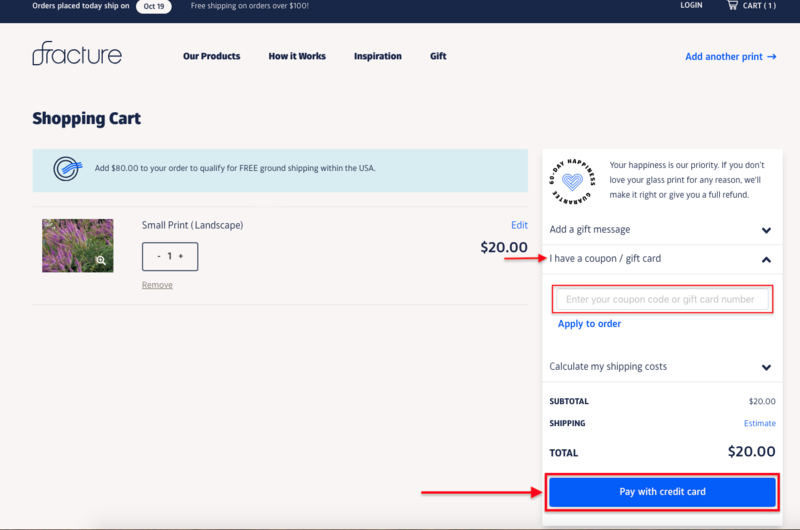 Enter your shipping address first, and you can enter a different billing address separately at the next step. Enter in the shipping information first. If you’re near Gainesville, Florida, you have the option to pick your order up directly from our factory! 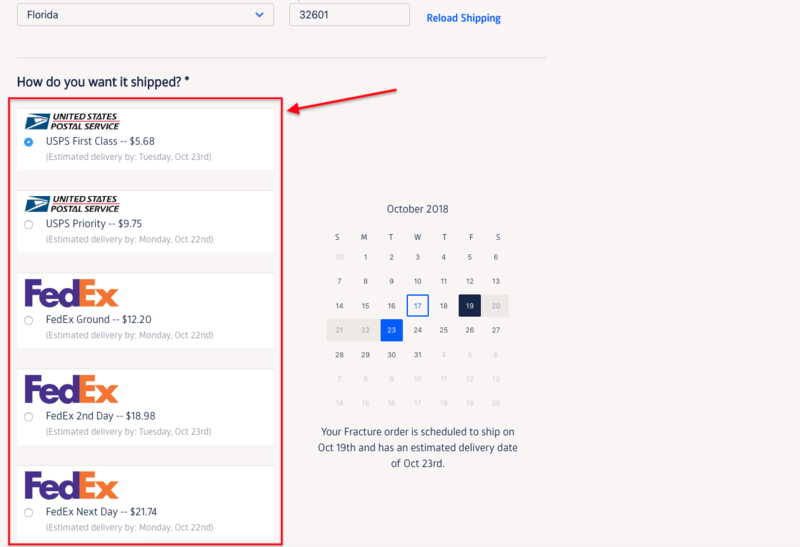 After selecting your shipping method, scroll up to click the Next button to continue. Last step! 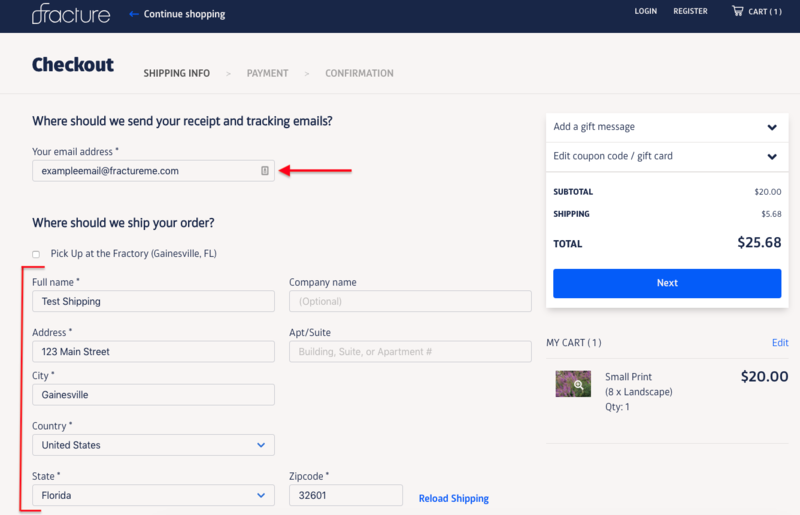 Just fill in your payment information and check off the box "My billing address is different from my shipping address" to enter a new billing address, if needed. Finally, click the "Place Order” button. Awesome! Your order has been placed and we can get to work on it! Be sure to keep an eye out in your inbox for an order confirmation email with your Order ID. We'll also send you an email with tracking information once your order ships out from the factory. We can't wait! 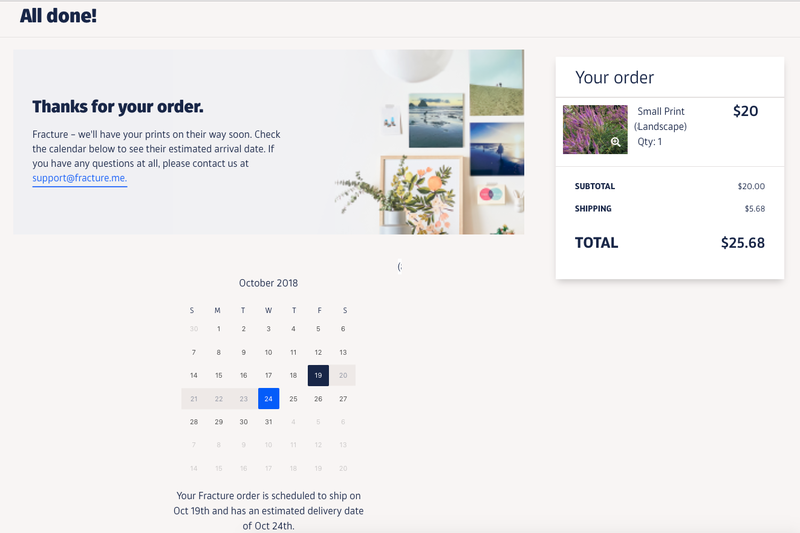 How long will it take to receive an order? Where can I find a receipt of my order?